When Trevor Bauer made his debut with the Cleveland Indians on April 6th against the Tampa Bay Rays he was less than stellar. In five innings he allowed three earned runs on only two hits. However, he walked seven hitters, four of which came consecutively to open the first inning. He received no run support as the Indians were shutout 6-0, earning Bauer the loss in his first start for the Tribe. He was subsequently shipped back to the Columbus Clippers for more work in the minors. Last night the 22-year-old from UCLA was recalled to make another spot start. This time he made his Progressive Field debut against a tough Philadelphia Phillies lineup. Thanks to a good twitter friend, I had the pleasure of being in attendance for the game with a bird’s eye view of the action. Bauer was the textbook definition of effectively wild. Though once again he only lasted five innings, walked six hitters, and only threw his pitches for strikes at a 59 percent clip, he was able to keep the Phillies off the scoreboard and allowed the Tribe bats to support him en route to a 6-0 final score and his first victory as an Indian. I arrived at the Jake just in time to see the long toss session I heard so much about. 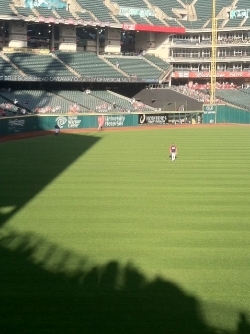 Trevor Bauer stretched himself all the way to the First Energy sign in right centerfield around the 375 foot mark. Pitching coach Mickey Callaway, throwing from the left field corner, needed a cutoff man to play “pickle in the middle” and complete his return throws. Bauer flirted with danger in four of his five innings on the hill. He was rarely ahead in the count. Many of his pitches were all over the place, often times wild high. Like his first start against Tampa Bay, he was not very efficient. However, he threw strikes when he needed to. Jimmy Rollins led off the game with a walk, but was promptly thrown out trying to take second by Yan Gomes. Michael Young struck on the following pitch. Ryan Howard, one of the most dangerous hitters in baseball, struck out looking to end the first after a walk to Chase Utley. With a runner on third in the third inning, Bauer caught Michael Young looking for his second strikeout to preserve a 1-0 lead. The Phillies posed another scoring threat with two runners on with two outs in the fourth inning. With his pitch count rising, Bauer got himself out of the jam again, striking out Carlos Ruiz for the second time. 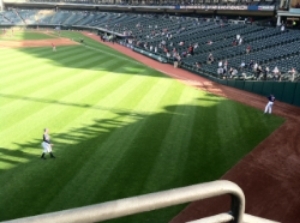 In Bauer’s final frame he walked the first two hitters but walked the tight rope and retired the next three hitters, leaving the game to a standing ovation. 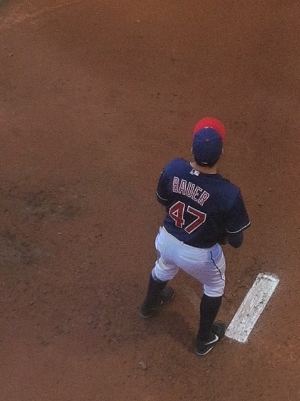 Watching live in person, it was clear Trevor Bauer still has control issues to work out. However, most of the pitches he missed on appeared to be fastballs. His off-speed stuff was downright nasty. To counter the six walks, Bauer struck out five and allowed only one hit to a lineup that boasted four all-stars, two MVPs, and one potential future star. Today Bauer was shipped back to Columbus, where he holds a 2.50 earned run average and 24 strikeouts compared to only six walks in 18 innings. While those numbers show that he is dominating the International League, one could make the argument after his erratic pitching in two starts for Cleveland that he still needs more seasoning. On the other side of the coin, after his effective wildness against Philadelphia, others would suggest that he stay with the Indians and take his lumps in the Majors. This early in the season the former may be the better decision. That would allow the Indians to see exactly what they have in their current starters at the Major League level while allowing Bauer more time to gain more confidence as a whole pitcher. The suggestion has been made that the ping ponging between the two levels may hurt the youngster’s confidence. However, Bauer is extremely intelligent and understands what the organization is trying to do. Whatever the case may be, after watching his first start at home live in person last night, it seems once he gets his control down, Trevor Bauer’s hype as a future star could very well come to fruition and the Cleveland Indians will pay dividends. Glad you enjoyed the game and the great seats. Good observations on an up and comer.